Dec. 13, 2013 - Which primary breakdown system a sawmill chooses to purchase is – and always should be – based on a multitude of important factors. These include a reputation for reliability and fibre recovery performance, as well as the ability to provide effective ongoing support. A specific sawline manufacturer might also be top choice because there is already a strong established relationship or a solid reputation. The right breakdown system is also selected on the basis of suitability to the mill’s raw materials: tree species, log size, and so on. Here are some stories of how several sawmills made their decision when upgrading their systems. A new primary breakdown system was chosen a few years ago at the Vanderwell Mill in Slave Lake, Alta. The company processes about 80 per cent spruce, with the majority of the rest being pine and a little Balsam Fir, into 6 to 16-foot 2x3”, 1x4”, 2x4” and 2x6” lumber. The mill owners chose a Comact OLI (optimum length infeed) canter quad with circular saws and chipping heads, with a TBL3 gang edger downstream. The side boards off the canter quad go to a three-saw board edger. Having a well-established relationship was a very important factor in purchase decisions when James Jones & Sons invested €26.5 million a few years ago in a new, high-tech mill in Lockerbie, Scotland. The company’s “Lockerbie 3” softwood mill features 13 AKE Sawmaster bandsaws, two canters and two Exeltec edger optimizers, all from Söderhamn Eriksson, providing production of over 250,000 m3 per year. Autolog breakdown lines at the Produits forestiers Temrex mill in Nouvelle, Que. This mill processes fir and spruce into 1x3” to 4x4” up to 16’. Some of it is dried on site and some is planed with an Autolog planer. One of the new production lines is for big lugs and the other is for small ones, explains Savoie. “The main line has two Autolog scanner/optimizers, one before our twin saws and the other one before our bull,” he says. “The secondary line only has one scanner because of space constraints, but there is a second optimizer that takes the scanner reading to get the job done on that line’s bull.” Temrex also purchased an Autolog edger and trimmer, both with Autolog scanners and optimizers. A good working relationship was also important in choosing a USNR breakdown system at Stimson Lumber’s Tillamook Operation in Oregon. It was installed by West Coast Industrial Systems during summer 2013. The system includes a USNR L&B 6’ vertical twin bandmill and a three-zone sharp chain outfeed for separation and dispatch. An update of the controls was also completed. The mill produces 8’ studs, 2x4” and 2x6” from hemlock (about 50 per cent), Douglas fir (40 per cent) and Sitka Spruce. Vaagen Bros. Lumber owns four mills, all of which have HewSaw breakdown systems. Its Colville dimension mill and Usk green stud mill, both located in Washington state, respectively run a HewSaw R200 A.1 from the mid-1990s, and a HewSaw R200 1.1 (Plus) machine installed in 2005. The operation in Eagar, Ariz., is a two-part mobile mill with a VK debarker and a HewSaw R200 SE. At the Hyne & Son Pty Limited mill outside Maryborough in Queensland, Australia, many factors were considered in its primary breakdown system selection. 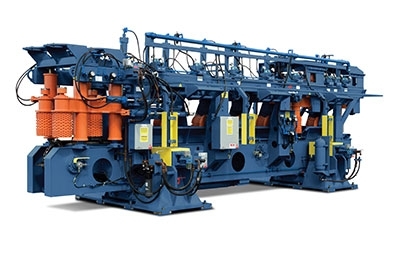 Linck sawlines (the first installed in 1989 and the second profiling line in 2002) were chosen after a global review of the available technologies. The mill produces predominantly structural products for the domestic market, with the majority 7.5 and 10 cm thick made from Southern Pine. Multiple factors always play a role in important decisions such as choosing a primary breakdown system. In these cases, an established working relationship and the reputation of the company stand out as key considerations. The Comact machine installed at Vanderwell Contractors in Slave Lake Which primary breakdown system a sawmill chooses to purchase is – and always should be – based on a multitude of important factors.